If you're someone that likes to grow Prized Crops in FarmVille 2, you've come to understand how valuable Fertilizer is. On the other hand, if you never use Fertilizer because you can never seem to keep any in your inventory, the game's newest update will also help. 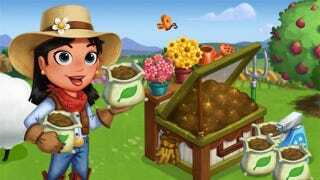 The brand new Fertilizer Bin building project will see you build a Fertilizer dispenser that can be filled by simply tending your animals around the farm. The Fertilizer Bin can be placed for free when you log into your farm, and from there, you'll need to collect building materials to finish it off. You'll need 10 Green Paint, 10 Grass Clippings, and 10 Wood Planks. These items can be earned via a combination of general news posts on your wall and individual requests sent directly to your neighbors. After you've collected these items, you can finish the Fertilizer Bin by asking four of your friends to help you out as staff. After you've completed the Fertilizer Bin, you'll be able to collect "Compost," a material that fills the Bin's meter and is collected by tending Adult Animals. You'll need at least one Adult Animal of any kind on your farm in order to keep the Bin operational, and once the meter is full, you can harvest the Bin to earn extra Fertilizer. This is a bit more complicated than that though, as you'll need to use "Fertilizer Rakes" to actually gather up any Fertilizer and put it into bags. These Rakes are crafted using six Pieces of Wood, and you can stock up on these Rakes for the future so that you don't have to craft them every single day. Of course, the more Fertilizer you use, the faster you'll master crops, so make sure to build your Fertilizer Bin and start putting it to good use as fast as you can. What do you think of this Fertilizer Bin? Do you always try to apply Fertilizer to your crops? Sound off in the Games.com comments! KotakuSocial is your one-stop shop for all of Kotaku's browser, Facebook and mobile-based social game coverage. Follow @KotakuMobile on Twitter and stalk us on Facebook.